Rupert Neve believes that audio gear should have a wide audio bandwidth, and in his new Portico II Channel, the bandwidth extends all the way from 2Hz to 160kHz between the ‑3dB points. This may seem generous even for those with pet bats, but it makes sense. Whenever audio devices are connected in series, the combined frequency response is reduced: the wider the response of each device, the less of a problem this is. Wide bandwidths also mean reduced phase‑shift, and provide high-sample‑rate A-D converters with something to chew on. As its name suggests, the Portico II Channel adopts a channel‑strip format, and is based on modules lifted from three existing Rupert Neve products, combined and enhanced with some useful extra features. It is nicely engineered in a simple steel rackmount case, adorned by a substantial metal front panel, clear black‑on‑cream printing and elegant anodised aluminium knobs. Coloured status LEDs are integrated into the push‑switches. As well as the expected mic/line amp, four‑band EQ and compressor/limiter, there's a variable 'Silk' section, a tunable de‑esser and some useful VCA filtering and detection options. A swept high‑pass filter may also be switched into the compressor's side‑chain, and a blend control allows parallel compression to be achieved. The circuitry appears to use full-size rather than surface‑mount components, but it isn't all discrete, as the compressor section is based around a VCA chip, and the circuitry also employs a number of the ubiquitous NE5534 op‑amp chips. Rupert's favoured single‑sided class‑A approach isn't strictly possible with op‑amps, but he uses a technique he explained to me many years ago when he was designing consoles for Amek. His trick is to offset the DC operating level by a Volt or so, which means that only one side of the circuitry is being used (and it is thus, in effect, operating in class A) until the signal level is well above that needed to disguise any crossover distortion from the double‑sided circuitry used by the op‑amps, which can be very objectionable even in tiny amounts. You lose a tiny amount of headroom in the op‑amp, but the trade‑off is well worth it. It's a simple, but brilliant idea! Inside the box, you can see that the circuits are predominantly made from discrete components. The Portico II Channel can accept mic, line or instrument DI sources, and the mic input presents a 10kΩ, non‑reactive input load that can handle signals of over 20dBu without the need for a pad, and which is claimed to maintain a 2dB noise figure over a wide range of gain settings. A 'thru' jack is provided for the DI input (also a jack) to allow the signal to be split between the Portico II Channel and an instrument amplifier. There are also side‑chain send and return points and Link sockets to connect two units for stereo operation. These connections drive the compressors from a common side‑chain signal, but the EQ sections remain independent. All connections other than the DI In and Thru are located on the rear panel. The mic and line input gain is adjustable in two stages, with a switched rotary control providing up to 66dB of gain in 6dB increments, and a conventional rotary pot for fine trimming over a ±6dB range. The 12dB/octave high‑pass filter is continuously variable from 20‑250Hz. Rather than feeding the microphone signal directly from the XLR socket into an audio transformer, which presents a reactive load, this design is based on a variation of Rupert's Transformer‑like Amplifier (TLA), which incorporates a toroidal low‑pass filter to attenuate anything above 150kHz, reducing the risk of radio transmission getting into the audio circuitry. This is a balanced but non‑floating circuit that, with the gain set to zero, can handle levels of up to 20dBu. Its input impedance is also higher than that of many mic inputs. This reduces the loading on the mics, which can be particularly advantageous with passive ribbon mics. Also on a balanced XLR, the line input feeds most of the same circuitry, but it has less gain available, and bypasses the phantom power to avoid unwelcome accidents. Only the fine gain-trim control operates in line mode, although the polarity‑invert button still applies. By contrast, the unbalanced DI input, which has a very high 3MΩ impedance, feeds both sets of gain control. Front-panel buttons activate the 48V phantom power, polarity inversion and mute, and select between mic and line inputs. An LED adjacent to the Trim control shows when a signal is present. The input transformer follows the TLA stage and the polarity‑invert switch, but comes before the high‑pass filter. The transformer output stage, meanwhile, is based around the design used for RND's 5088 console, and uses class-A discrete circuitry to drive the transformer. This provides a floating output with true galvanic isolation, the maximum output level being +25dBu, at which level the audio bandwidth is still 20Hz to 40kHz. According to the block diagram, the output transformer has a primary winding to feed the level meter, and a separate secondary winding for the Texture/Silk feedback circuit. The rear panel includes a 'link' socket, enabling two units to work in tandem on stereo material. The Silk circuit in previous Portico units introduced a small amount of harmonic distortion and some tonal shaping. Here, though, the feature has been given an enhanced range, so that pressing the Silk button a second time brings in 'Silk Plus' mode, which RND say gets close to recreating the sonic signature of vintage class-A analogue consoles. The switch LED shows blue for standard Silk and red for Silk Plus. The amount of 'silk' is governed by the Texture control, which goes from zero to around twice the amount available in previous units. Much of what the Silk circuit does is not explained in detail, but I know that it reduces the amount of negative feedback around the output transformer stage, adding subtle second-harmonic distortion, while also modifying the frequency-response curve to create "a sweet and musical sound”. The equaliser section comprises four bands. The outer two are switchable from bell to shelving filters, while the inner two are fully parametric. When the outer bands are in bell mode, the Q value is around 2.5. In shelving mode, the high‑frequency filter has what RND describe as an "accelerated shelf characteristic”, which I assume means the filter is tuned up slightly at the turnover point, to create a steeper slope with a sharper knee. This is a long‑established Rupert Neve feature, and dates back to the classic 1064 and 1073 designs. By default, the EQ section sits between the preamp and the compressor, but it can also be switched after the compressor if you prefer. The low-frequency section offers ±15dB level adjustment, at switchable frequencies of 35, 60, 100 and 220 Hz. Both parametric mid controls share a bypass switch, and again offer ±15dB of level adjustment. Each filter's Q is independently variable from 0.7 to 5, while the frequency range of the lower filter is variable from 70Hz to 1.4kHz and the upper‑mid from 700Hz to 14kHz. There's also a master bypass switch for the overall EQ section. In a novel departure from tradition, the upper‑mid control is also used to tune the unit's new de‑esser circuit, and an adjacent control adjusts the amount of de‑essing. Only frequencies in the range set by the EQ controls are attenuated. Behind the scenes, the De‑ess control regulates an independent frequency-conscious limiter, and engaging the de‑esser doesn't prevent that EQ band from being used normally. It's also possible to use the de‑esser to tame strident peaks in instrument sounds. This works well, but the lack of any visual indication of the de‑esser's operation, or any facility to monitor the detected 's' component of the signal, post‑filtering, is frustrating. Although it takes up only around a quarter of the panel space, the compressor section is surprisingly versatile, not least because it offers the possibility of adjustable parallel compression via the Blend control. Its signal path is extremely clean, which isn't surprising, given that it uses a THAT Corporation VCA chip as the gain‑control element. As with RND's Portico 5043, the compressor circuitry offers both Forward Feed and Return Feed modes. The difference between the two is mainly to do with the point in the circuitry at which the side‑chain monitors the signal level. A forward‑feed design monitors the input and then sends that information forward to the gain‑control section, whereas a return‑feed device monitors the output from the gain‑control element, which turns the whole gain‑control system into a type of gain servo with feedback. As a general rule, the more modern Forward Feed topography results in a more tightly controlled sound. By contrast, the feedback or Return Feed arrangement results in a looser, more relaxed sound, with perhaps more gain‑pumping at higher ratios, and can make it a little trickier to arrive at the optimum settings. Depending on the material being processed and the compressor settings, the difference between the two modes can be either quite subtle or very obvious. It is interesting to note that the Return Feed mode is more akin to the way a human engineer works, in that fader level changes are invariably made while monitoring the post‑fader signal, so that the effect of any change is immediately obvious. The ratio is continually variable from 1:1 (do nothing) to 40:1 (limiting), while the threshold can be set anywhere from ‑30dBu to +20dBu. The attack time is variable from 20‑75ms, but can also be switched to a 'fast' mode where it will go as low as 0.1ms, to keep transients under control. There's also a choice of peak or RMS sensing. Release times range from 100ms to 2.5s, but there's no auto‑release option. Up to 20dB of make‑up gain is available and, as I've already mentioned, it's possible to link two units for stereo operation. As if that weren't enough, pressing 'HPF to SC' inserts the high‑pass filter from the EQ section into the compressor side‑chain to tame unruly low‑frequency sounds that might otherwise dominate the compressor's operation. The Blend control simply mixes the compressed and dry signals, and has the subjective effect of lifting low‑level detail rather than suppressing high‑level events, as with standard compression. Used more aggressively, this can be used to inject energy into rock and dance tracks, or to beef up drum parts. Insert send and return jacks on the rear panel can be used to introduce external EQ into the compressor side‑chain where more precise, frequency‑conscious operation is required. Alternatively, the return socket could be fed from a different source, to create ducking effects. 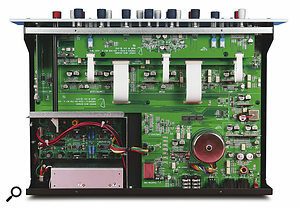 The output section to the right of the front panel includes the power button, 16‑step metering for both output level and gain reduction, and the Silk controls described earlier. Although this device offers low distortion and an extremely wide audio bandwidth, the use of transformers in the signal path gives it a subtle flavour that most engineers would find musical, even with all other processing bypassed. Subjective terms like 'gloss' or 'polish' are often bandied around, and it's easy to see why: the end result really does seem very smooth, yet without transient detail being in any way diminished. The dual‑mode compressor feedback arrangement intrigues me. The Forward Feed mode sounds like a top‑quality modern compressor, with little obvious pumping even when applying quite large amounts of gain reduction — but choosing fast attack and release times can induce a little gain‑pumping if that's what you want. Transients remain clean and dynamic‑sounding, even when compressing quite hard, and I really had to work to make this compressor misbehave: if you're going to use this compressor while tracking, it's unlikely to land you in trouble through excess processing. Switching to the Return Feed mode produces a sound that is, to my ears, a little more open and natural, but perhaps not quite so firmly controlled. It's worth mentioning that I found that I had to adjust the ratio and time controls when changing modes to arrive at suitable settings for the same material. The Return Feed mode is quite kind to complex mixes, so it would be well worth trying it as a bus compressor.You'd need two of them for stereo operation, of course, but the link control allows for that. As for the EQ, this design has the elusive quality of being able to change the tonal balance of a sound over quite a large range without the end result actually sounding as though it has been EQ'ed. Even high levels of boost sound fairly benign and natural, yet there is always more than enough range to get the job done. Anyone who's used one of Rupert Neve's EQ designs before will know what to expect: they're typically brilliantly musical and natural‑sounding, and this is no exception. I had to use the de‑esser function with care to avoid dulling the sound, and I also missed the niceties of a dedicated de‑esser that I mentioned earlier — but what it does, it does well. I only had to locate the desired frequency and bandwidth using the upper-mid EQ controls, then use the de‑ess control to bring the sibilance down. It also worked well in conjunction with the normal EQ operation for limiting the amount of upper‑mid boost applied to a vocal or instrument sound — almost like having a band of dynamic EQ. Although the Silk control isn't an equaliser, it does affect the tonality of the sound. Again, I found that it was fairly subtle, but imparted a valve‑like, larger‑than‑life character and density to the sound, which enhanced detail and made vocals sound more up‑front. A colleague suggested to me that the unit might have been even more useful in a modern hybrid-studio environment if separate inputs and outputs had been made available for the mic preamp, EQ and compressor, as on something like the SPL Frontliner. However, I can see why Rupert Neve didn't do this, as to maintain the impeccable audio quality would have meant duplicating that sophisticated transformer output stage for each section, which in turn would have made the unit far more expensive. Nevertheless, I concede the point that it would have been nice to have been able to record via only the preamp while having the equaliser and/or compressor hooked into the system via insert points. You could always invest in the dedicated Portico 'separates' for that, of course. I'm not usually an advocate of processing a signal while recording, because modern digital systems allow enough headroom that there's no need to compress on the way in, and there's always the risk of doing something I can't undo later. However, I'd be prepared to make an exception for the Portico II Channel, because it does everything in such a smooth and natural‑sounding way, even when applied in high doses. This channel strip certainly upholds the reputation of the series, and although it doesn't come close to being 'cheap', it is a high‑quality, hugely musical and versatile front end that you'll never outgrow. SPL's Channel One provides similar functionality at a lower price point, but uses part‑valve circuitry rather than all solid-state. It would also be worth considering similar devices by Focusrite, Manley, Tube-Tech, Summit and SSL — and of course the flexible API 500-series Lunchbox system (or the rest of the RND Portico range) would allow you to build your own high‑end recording channel. Extremely musical yet very versatile. Well engineered and easy to service. Based on existing (ie. good!) Portico designs. This is simply one of the best front ends I've ever used, and it is extremely difficult to make it sound bad. If you must track through EQ and compression, I can think of few devices that could do it better at any price.